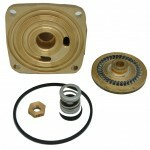 Repair Kit for All CT6M Series Pumps. Kit Includes: Impeller, Raceway, Shaft Seal, O-Ring Gasket, Impeller Locknut, and instructions. Burks Pump Catalog is a division of Tri-State Pumps Inc. / Manufacturers Edge, Inc. and is not a subsidiary of Crane Pumps and Systems. Copyright 2009-2014. Burks Pump Catalog. © All Rights Reserved.